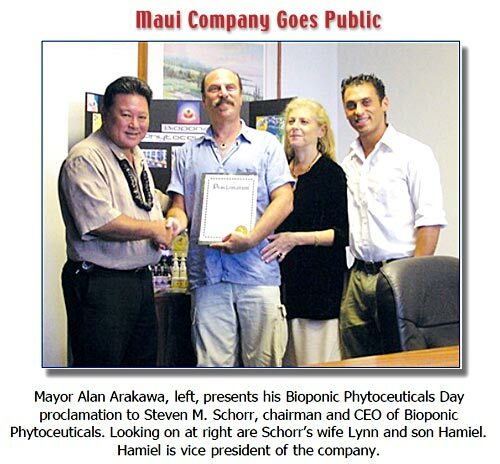 Maui company goes public Monday, June 19, 2006, was Bioponic Phytoceuticals Day “throughout Maui County,” according to a proclamation by Mayor Alan Arakawa. On that day, Bioponic Phytoceuticals, a local biotech company producing natural remedies and supplements, began public trading. This is an extremely rare event for a Maui entity. Several of the company’s products—including Flight Spray, O Spray and several lines of remedies based on traditional Hawaiian la‘au lapa‘au medicine—have gained broad national exposure and celebrity endorsements. However, it will be public trading, not just product promotion, that will launch the innovative organization into its next major phase of developmental growth. As the stock shows up in the market, it will be trading under the stock-market symbol BPYT. Bioponic Phytoceuticals, Inc. ("Bioponic" or "the Company") (OTC: BPYT - News) today announced that all of its 11 product lines covering 83 products will be immediately available for sale on Amazon.com's online stores. Bioponic Phytoceuticals, Inc. ("Bioponic" or "the Company") (OTC PK: BPYT) today announced that Shares of Bioponic Phytoceuticals, Inc.’s common stock will be traded on the Nasdaq Pink Sheets Market under the trading symbol "BPYT".